There was one gate into the courtyard of the Tabernacle (Chapter 8, 'Made According to Pattern', by C.W. Slemming). There is but one way to God, and that is through Christ, not many ways. John 14:6 "Jesus saith unto him, I am the way, the truth, and the life: no man cometh unto the Father, but by me." The process is begun when one enters in by the gate. 3 Nephi 14:13 "Enter ye in at the strait gate; for wide is the gate, and broad is the way, which leadeth to destruction, and many there be who go in thereat." The "way" is through or by rebirth of the individual unto God through the power and redemption of Christ. 2 Nephi 31:17 "Wherefore, do the things which I have told you I have seen that your Lord and your Redeemer should do; for, for this cause have they been shown unto me, that ye might know the gate by which ye should enter. For the gate by which ye should enter is repentance and baptism by water; and then cometh a remission of your sins by fire and by the Holy Ghost." Although the gate was most always shut to protect the inside of the Tabernacle from animals and other intruders, the gate was not restrictive. The opening of the gate was wide enough and made of cloth so that anyone in any condition could make their way through it. They only had to reach out their hand and move aside the curtain that formed the gate. Although the gate was shut, it was open to all who made the effort to find it by walking about the walls of the Tabernacle and then to open it themselves. This is faith. We too must seek out the gate, the way and then we must reach out our hand and push back the screen that conceals the entrance to the path before we can begin. But this is within everyone's reach who has the desire to do so. This is the first step, the step of decision, of exercising our agency to follow Christ. John 10:9 "I am the door: by me if any man enter in, he shall be saved." Seek out Christ, the gate; He is the only Way of salvation. 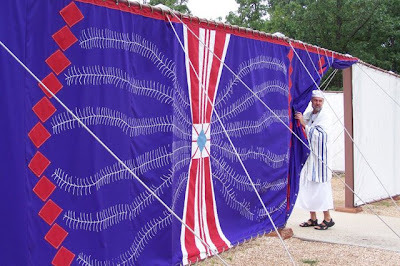 The gate was formed by a large drapery of fine linen and yarn of blue, purple, and scarlet. The gate formed a line of demarcation between the world and God's abode. We too must guard a line of demarcation between ourselves as well as His church and the world. That line is set by God, not man. Once we step through the gate, we should leave the world behind and focus on our walk along the path of Life. Although only the high priest could enter the Holy of Holies and only the priests could enter the Holy Place, everyone in the camp of Israel could enter into the courtyard through the gate. The courtyard was the place of sacrifice and all needed access to what it offered the children of Israel, both old, young, rich, and poor alike.